Choman Hardi was born in Sulaimanya, Southern Kurdistan in 1974 and grew up there. She has lived in Iran and Turkey before coming to England in 1993. She has published two collections of poetry in Kurdish: ‘Return with no memory’ (Denmark, 1996) and ‘Light of the shadows’ (Sweden, 1998). She is also an artist and has contributed to a number of joint exhibitions in Britain and across Europe. 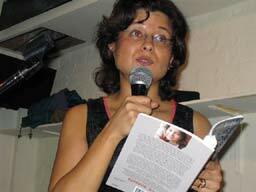 Choman is the chair of ‘Exiled Writers’ Ink which is an organisaiton consisting of established refugee writers who write in another language as well as English. The organisation aims to represent those writers whose voice has not been represented in the main stream British media. Choman studied philosophy and psychology at Queen’s College, Oxford and has an MA in philosophy from University College London. Currently she is a PhD candidate at the University of Kent at Canterbury, researching about refugee women and their mental health. Her father Ahmad Hardi, who also lives in London, is a very well-known and much respected Kurdish poet. and a little girl who kept dreaming about chicks, goats and rabbits.